If you have an RV, or even a boat or Jet Skis, you make it a point to vacation near a large body of water. So, we created a list of our favorite beachside RV parks that include all the comforts and amenities you need. The following parks and resorts are filled with immaculate RV sites, as well as an idyllic backdrop to long-lasting memories with loved ones. It’s also important to make sure your RV has the right coverage. Speak with an RV Insurance Specialist at (866) 501-7335 to make sure your RV is covered with the best insurance for the best price. When is your next adventure? 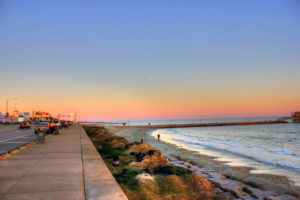 This beachfront RV park in Galveston, Texas is a small paradise for RVers who want access to over 30 miles of sandy beaches by just stepping out of their rig. At this RV resort, you’re practically surrounded by the wraparound pool! Just when you thought your RV adventures couldn’t get any better, they offer miniature golf and a breakfast menu that is $5 or less. Biscuits and gravy, anyone? This quiet little town near Galveston is a great low-key weekend getaway for Texans and visitors alike. Remember that this is a free beach so there are no lifeguards on duty. Make sure to supervise children closely. It’s always hard to pick just one California RV park in this category because there are several great campsites on or near the state’s beautiful beaches. 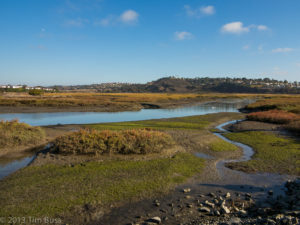 However, San Elijo stands out because of San Elijo Lagoon and its proximity to Cardiff-by-the-Sea. This area is a very yoga-centric and health-conscious community. If this resonates with your lifestyle, you can’t skip this beachside RV park. Perched on the edge of a cliff, the views from the sites are mesmerizing. The facilities are exceptionally clean and new but rates are very affordable. It’s also very close to San Diego, where you can visit the famous San Diego Zoo, hear live music and eat in amazing restaurants! There’s even a surf school right on the campground. There’s a reason this RV park was ranked #1 in Northwest Florida and #2 in all of Florida, which has a very large number of beachside RV parks. 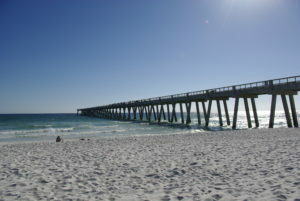 The best part of staying at this particular one is that it’s located in Navarre, Florida. Right, you’re wondering where that is. Chances are that you’ve never heard of it because it’s a little gem of a well-kept secret among Floridians. If, like many RVers, you prefer to avoid large crowds but still go into town for cultural excursions, this is just the place for you to park. Did we mention that you also have access to the Gulf Islands National Seashore, voted #1 East Coast Beach last year? 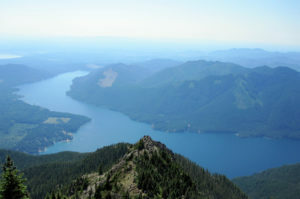 At Skokomis Park, you have over 500 acres of 5-star hiking trails that wrap around Lake Cushman, which is a stunning body of water. It’s so beautiful here and a simple bike ride becomes an epic adventure for the eyes. Yes, the 9 miles of trails are mountain-bike friendly! There are 34 RV sites, which offer 20- and 30-amp power, fresh water and a sewer connection. Daily and weekly rates are very reasonable, as RV parking is as low as $52 a night and $20 for a boat-launch fee. If freshwater fishing or boating is what you’re into, there’s really no better place than Skokomis Park at Lake Cushman. If you want the experience of visiting a quaint beach town, which hasn’t been completely overtaken by tourists, this full-service, full-hookup facility may be just what you’re looking for. 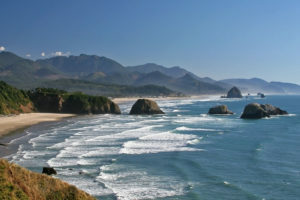 Many people compare Cannon Beach to small beach towns in California because of all the great shops, museums and dining in and around the campground, all without the crowds. Cannon Beach RV resort is both family and pet friendly. It’s lush and park-like with a gift shop and game room in the lodge. There are 100 full-hook-up spots here, and that includes 11 pull-throughs. For only $52 a night, you also have access to a heated indoor pool and spa. If an ocean is not enough to make you happy, you can have your very own lake to splash around in at the Beachcomber Camping Resort. 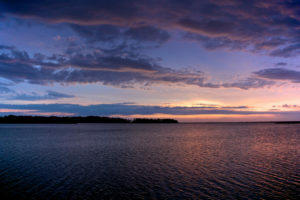 The RV sites are spacious and offer full hook-ups as well as close proximity to several beaches. Activities abound if you walk to Wildwood Boardwalk and rates are under $80 a night. What else could you possibly ask for? Oh, did we mention the arcade on the campsite or the bath houses? You can rent a boat or bring your own at this beachside RV park. People love playing all sorts of games and sports, like volleyball and shuffleboard. In short, if fun is your thing, you’ll love this place. 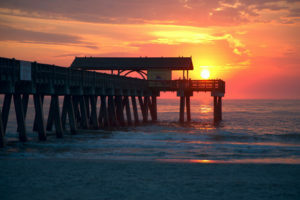 Only a half-mile from the beach and a short drive into the historic town of Savanna lies Tybee Island, often called “Savannah’s Beach.” Local attractions include the Tybee Lighthouse and Museum as well as the Tybee pier and pavilion, which is filled with all sorts of food and fun activities. Full hook-ups include fresh water, 30- and 50-amp electricity, standard cable and sewer. Each site is different in length and width so speak with a reservationist to make sure you get the right size site for your RV. Preferred hook-up sites allow a maximum of 8 people and 2 vehicles. Tents are not allowed in RV sites. This RV park is clean, beautiful, family oriented and so pet friendly that your dog is allowed on the beach! 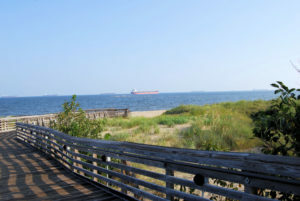 Located near the Virginia Aquarium and Marine Science Center, First Landing State Park is the perfect vacation spot for those who have curious kids. But campers of all ages come here so you’ll see groups of young people as well as families in this stunning park. The campsites are only a short distance from the beach, with miles of hiking trails that lead straight to it. You have an option of a site with or without electricity, water and hookups. The best part of this beachside RV Park is that after you fall in love with it, you have the chance to revisit during all four seasons. And if your RV is setup to brave the winter cold, this is the place to be for New Year’s. Locals love this park. You will too. Kill Devil Hills is not just a great name but it’s a stunning destination for beach lovers visiting North Carolina. 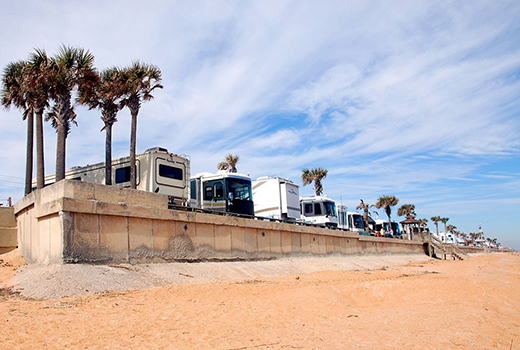 The OBX Campground is loaded with amenities, including pull-through sites and big-rig access. There are full hookups here, including electric, sewer and water, WiFi and even laundry. This oasis on the Outer Banks of Colington Island is removed from the usual tourist traffic. With that said, you will need to drive to the beach unless you plan a hike to get there. But you’ll do anything for some quiet camping and privacy, right? You’ve heard of Lake George and there’s a reason for it – It’s an incredible place to vacation. With over 6 million acres of Adirondack Park, you and your cohorts are sure to make some memorable moments if you stay at Lake George Escape Campground. Did we mention the sparkling lake the park is named after? Well, its beauty is certainly not hype! There are 575 sites to choose from here, including spots for both pull-throughs and back-ins. You also have a choice of pond front, waterfront or wooded sites, each of which has its own unique charm. How amazing does that sound?